It’s a testament to a game’s atmosphere when it can inspire you, the player, to stop in your tracks, forget what you are doing and simply watch in awe at what lies before you. A gorgeous vista -- perhaps with a beautiful sunset accompanying it -- comes to mind immediately, the view so lush and amazing that it’s hard to resist taking it in; but no matter what the moment actually is, the beauty of the experience comes from what it makes you do rather than what it happens to be showing. Think about it for a second. Games are made up of rules and systems, most of which give you goals and objectives to work towards for success, progression or other rewards. To physically make you stop, to get you to forget about your primary goal in favour of focusing on something totally unexpected and emergent, is a quality that few games manage to achieve. Sure, we all have our examples and it’s definitely something that has become a touch more frequent in the recent past, but that ability in itself is a strong example of good game design, of a carefully considered world or aesthetic and of rewarding the player’s immersion rather than their completion of a task. Because, despite the unexpected appearance of these moments, they only work if the developer -- who created the possibility of it appearing -- and the player -- the one who discovers it -- are working together, the former creating a believable world and the latter engaging with it in its entirety. Immersion has become a bit of a buzz word for those describing their experiences with games and for good reason: the more immersed a player is in a game, the more invested they are in the entertainment they’re consuming. The reasons for why differ for each player. Red Dead Redemption is a fantastic example. Its ability to stop me in my travels in order to take in a view, observe the wildlife or watch as the residents of a local town go about their business, is certainly something few other games manage to emulate. It helps, of course, that the world is rich in detail and is quite the sight to behold but delve beyond the superficial elements and deeper into the environment as a whole, and you’re bound to come across some really fascinating, compelling places. Why, just this very evening I was wandering aimlessly around in the game’s world, surprised by what I came across. Rain caused me to slow my horse to a stop, jump off and bask in the atmosphere of its steady, consistent flow; walking inside a nearby house I was struck by how realistic it sounded as it pelted the wooden roof above; stepping outside once more, I simply watched as its density increased and the surrounding environments got darker. I walked to a nearby pond and watched the drops scatter across its water; I ventured to a dirt path and observed the puddles and mud slowly forming; I then let the game idle, eventually leading to it taking over and fixing a camera in a random location, simply designed to show off the view. 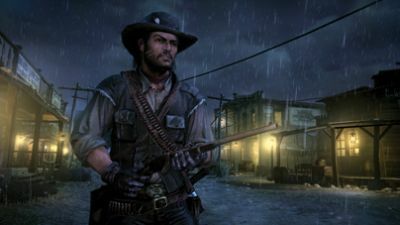 The ambience was amazing, the atmosphere incredible, and it was enlightening to watch how the mere presence of rain -- something I’ve celebrated in the past -- completely changed the experience, halted any progress I may have been attempting to make and inspired a mood that I didn’t expect a game set in the Western genre to create. It was cathartic, but not in a way I could have expected -- an experience to relish as I continue on my Western adventure. It’s not the only moment that has caused me to stop, however. The residents of MacFarlane’s ranch have enthralled me more than once, their casual and relaxed nature really moving after the many fights and close-calls I’ve had in my travels. Because of this, I try to ensure that whenever I stop playing the game I do so there, as it’s an environment I’m thoroughly comfortable in and it has a nice ambience that dictates the pace of my next session in a really engrossing way. To walk out of my house one evening, my horse hitched right beside it, and see the locals gathered around the campfire chatting about their day is alluring; to sit and hear one of them play tunes on his violin utterly enchanting; to walk out across the main dirt path and towards the barn, find a lady playing fetch with her dog and simply watch as one throws, the other receives, simply delightful. On their own, each may be a simple moment, completely insignificant and unrelated to the core experience of the game -- the story, the characters that define it and the actions and events that occur -- but when combined with the other poignant, unexpected little treasures that can be found throughout one’s travels, they form a narrative that is unique to me and only enhances the time I spend in that world. Red Dead Redemption as a game may be about the Wild West slowly dying, but as my adventure it’s about the little hints of life that appear when I least expect them to, reinforcing why my own existence in this world is important. My impact may be little, but its impact on me will be with me forever. I know exactly what you mean about the engaging world that RDR is set in. I grew tired of the mission format long before the end, but it was still well worth completing just to experience the surroundings. In hindsight it's a game I wish I bought rather than borrowed, for the atmosphere alone. A heartfelt post. 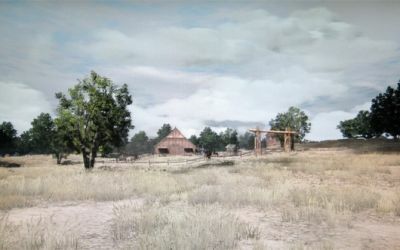 The atmosphere of Red Dead is above and beyond so many of its age. The game's sound designers deserve for more credit they receive. Sorry for the delayed response, guys. Michelle -- I think I'm about to enter into Mexico (not 100% sure) but yeah, I'm beginning to get bored with following the mission structure and much prefer just randomly exploring and being in the world. Having said that, I actually am enjoying the story and want to continue it (despite the spoiler too!) but that means following a structure I'm not ready for right now. My experience with the game is therefore a little conflicted at the moment and, I must admit, slightly off-putting too. I'll keep at it though. As per usual, thanks for stopping by you two.